Lumens5 + is an integrated modular information system for higher education institutions developed to meet the needs of managing a modern faculty as well as university as a whole. Its main qualities are functionality, simplicity, integration, modularity and multilingualism. It is designed according to the highest technological standards in line with the requirements of the Bologna process and needs of the modern knowledge society. In the Republic of Croatia’s higher education system several specific information systems and databases are being used. Existent systems are used at different levels and for different purposes. One of the most aggravating administrative and operational activities are oftentimes retrieving, customization and integration of diversely structured data, that are being collected, processed and stored in different manners by institutions, their departments and services, or individuals. When the moment or a higher instance requires, certain data, analyses or reports are sought, exported from various sources and adapted to the required form. Such work requires a lot of time and effort. Furthermore, with data transfers and editing in inadequate tools and by improvised procedures, human factor influence becomes important and possibility of error is much higher. 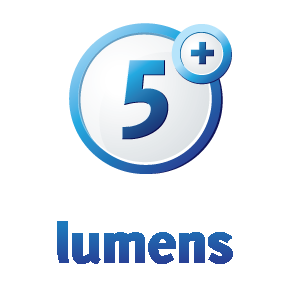 Lumens5+ is characterized by integrity as well as horizontal and vertical integration in gathering and monitoring data relevant to higher education system. At any given moment, the end-user is able to easily select parameters based on which credible reports, reviews, and analysis are being created real-time. Lumens5 + was developed by a multidisciplinary team of experts, which includes university professors, administrative staff, design studio and a team of skilled programmers. When Lumens5 + system was being created, most of our time was spent on the user analysis; analysis of user needs and behaviour patterns, and problems they face. Through an attractive and easy-to-use interface, Lumens5+ user is able to quickly perform all his tasks, find required information or communicate with other users of the system.